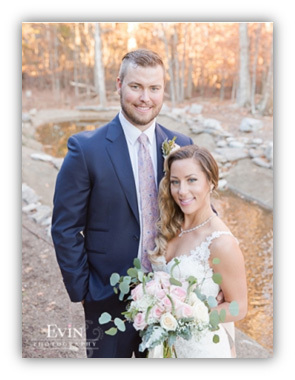 Every bride and groom is beautiful, but we cannot deny that Jimmy and Melissa Nelson are stunning! Just look at them! Jimmy plays for the Milwaukee Brewers and Melissa is a fashion blogger for her own lifestyle brand, Highlights and Hemlines. Talk about a fun fairytale life, right? 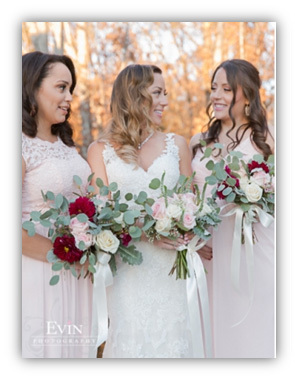 Jimmy and Melissa opted for a small intimate wedding of close family and friends which illustrated that their wedding was their love, choosing not to get caught up and overwhelmed with every single wedding detail. Melissa had two bridesmaids, her sister and best friend, and Jimmy had four groomsmen. We love that they did not feel obligated to have an even number for their wedding party. Once again, not caught up in the “traditional” details but chose what felt right them for them. The Lodge is a fabulous location nestled among nature on the Percy Priest shore. 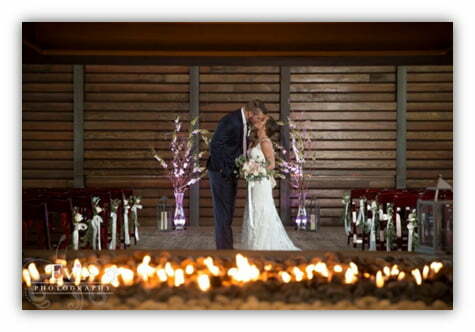 The wood interior and warm fire place makes the Leadership center ideal for intimate weddings. Since the venue is primarily a conference center, we love that Jimmy and Melissa incorporated aisle markers in their ceremony to further transform the venue. seeded eucalyptus and ruscus were highlighted by a single white rose tied with cream, creating a nice pop from the dark wooden chairs. Jimmy and Melissa also wanted white blooming branches as their altar. Unfortunately, branches do not bloom in wintertime but because Beyond Details aims to please, our florist spent several hours wiring white blooms to curly willow – talk about customer service! Beyond Details always wants to make sure that we can deliver a couple’s vision. Rather than doing a traditional buffet, Melissa and Jimmy opted for dinner to be served as stations. 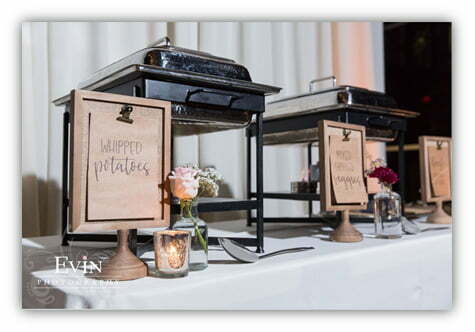 The couple had a slider station with barbecue chicken and barbecue pulled pork sliders, five cheese creamy macaroni and cheese bar, carved beef tenderloin with garlic smashed potatoes and grilled mixed vegetable station, a fresh vegetable and bread station, and lastly a dessert bar. Since the guest count was an intimate 80 people, there was no need for to rush guests through a buffet line, but rather stations allowed the guests to mingle and eat as they pleased.